Be Quiet!, the market leader in PC power supplies in Germany for ten consecutive years*, presents the Dark Base 900 series featuring two absolute high-end cases with groundbreaking features. 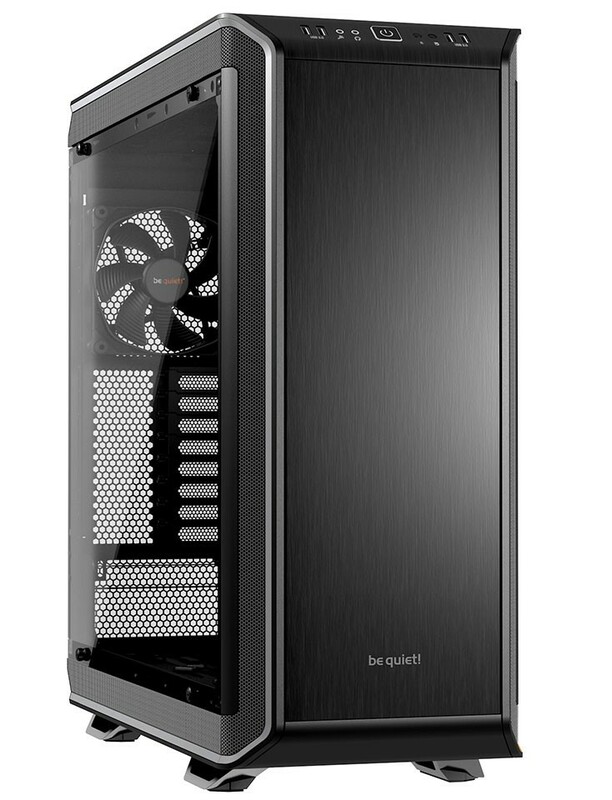 With unmatched flexibility through a modular design, efficient cooling with SilentWings 3 fans and an extremely low noise level, the newest addition to be quiet’s portfolio is the optimal solution for enthusiasts and individualists. The cases feature a remarkable elegant design, topped off on the Dark Base Pro 900 with a stunning side window made of tempered and tinted glass. This model also includes LED lighting and a wireless Qi charger. The brand-new be quiet! Dark Base 900 series leaves nothing to be desired regarding possible system configurations because the modular design opens up various possibilities for the optimal placement of components. 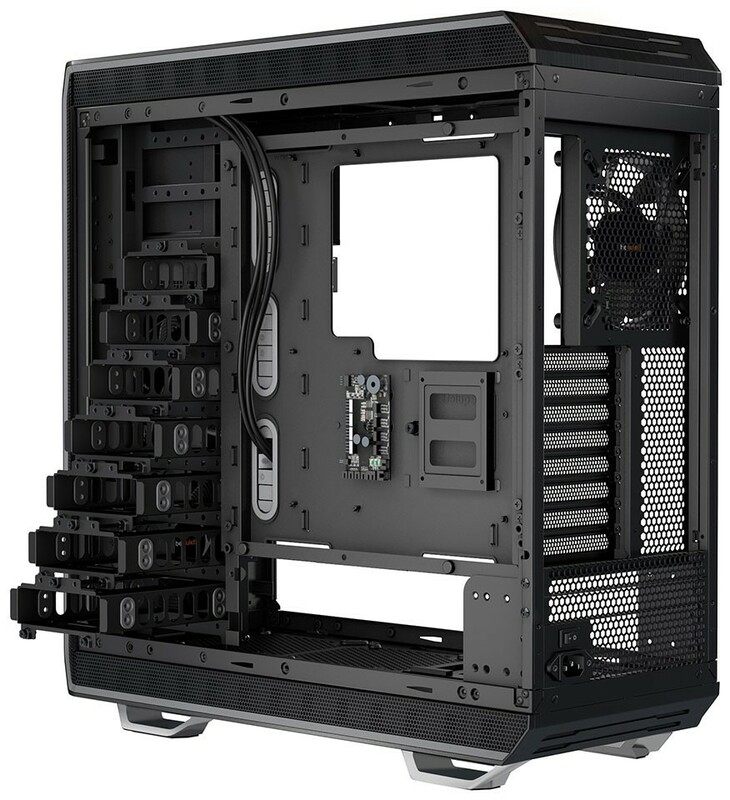 Proving the point, the removable motherboard tray can be installed in six different positions and can accommodate all types of boards up to E-ATX or XL-ATX form factor. Fitting the specific hardware and cooling configuration, the perfect orientation can be found without any issues. In addition, it is very easy to assemble most of the parts outside of the case. In combination with the individual HDD slots the Dark Base 900 and the Dark Base Pro 900 offer unbeatable flexibility and compatibility, providing a perfect enclosure for high-end configurations with watercooling and overclocking, absolute silent systems, as well as upper-class workstations. For the necessary storage devices, the Dark Base 900 series also offers sufficient mounting space: up to 15 solid state drives, 7 HDDs, and 2 optical drives can be installed. Another highlight of the new high-end case from be quiet! 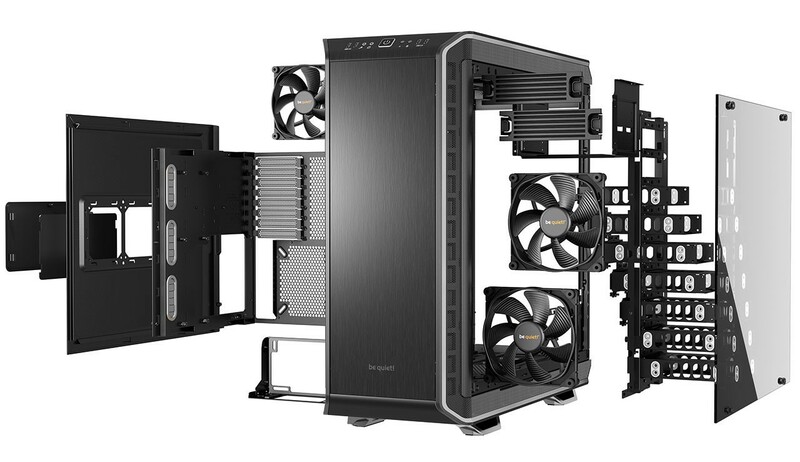 is the sophisticated cooling with perfect airflow, thanks to three pre-installed 140mm SilentWings 3 PWM fans. With their unique rotor blade design, rubberized frame and funnel-shaped air intake, these fans work silently and efficiently. At the same time, the 6-pole motor with fluid dynamic bearing (FDB) reduces power consumption and vibrations. 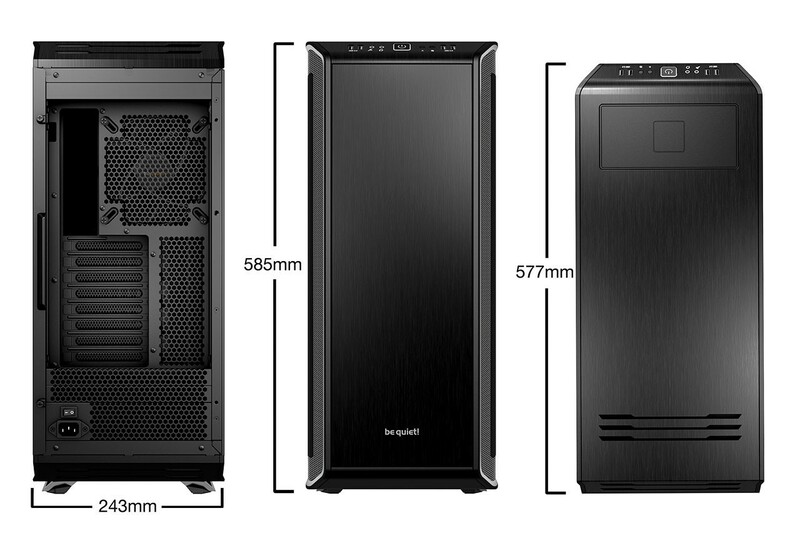 The comprehensive airflow concept is complemented by L-shaped vents in the case, which leads to a reduction of noise. Additional noise reduction is achieved by using insulating foam mats at the front, top and side along with specific decoupling mechanisms of key components. Another highlight is the stepless fan controller, supporting three (Dark Base 900) or four (Dark Base Pro 900) standard or PWM fans. 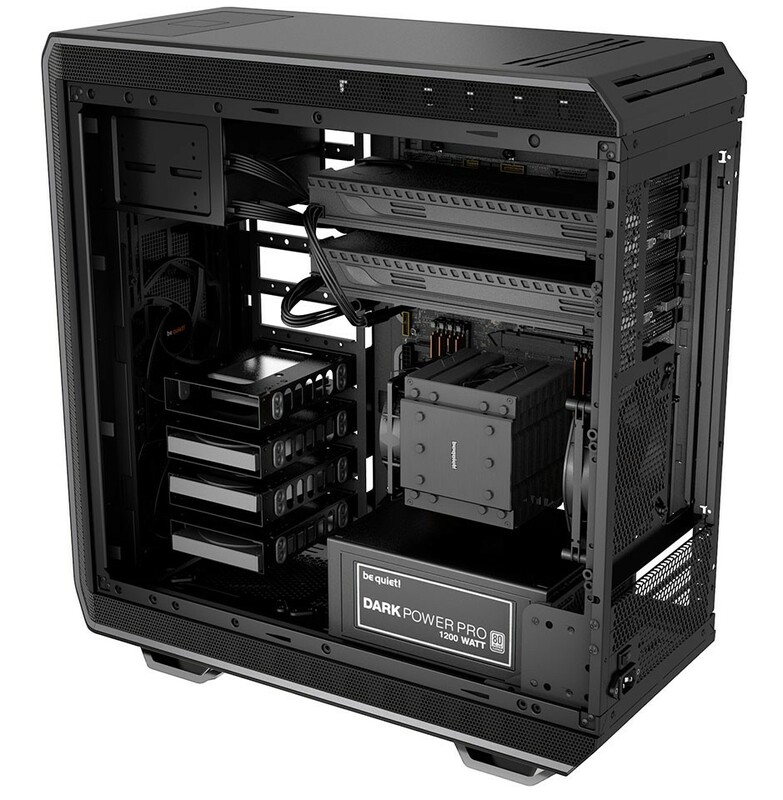 Ample space is provided in the interior making the chassis also suited for powerful water cooling solutions with several radiators. The Dark Base 900 is not only a technical masterpiece, but also stands out with its high-quality materials and great design: smooth aluminum surfaces and robust steel lead to extraordinary elegance and stability. The top model is equipped with a decoupled side window made of tempered and tinted glass. In addition to that, be quiet! includes LED strips, which can be freely positioned and illuminate the interior in five different colors. The Dark Base Pro 900 even features an inductive charging station for wireless charging of smartphones and other Qi-compatible devices. The standard version is equipped with a 2-in-1-side panel, which allows up to two optional fans for further airflow optimizations. Both variants of the case will be offered with the highlight colors orange or silver as well as in an all-black version. The Dark Base 900 and the Dark Base Pro 900 are commercially available as of today. The recommended retail price of the standard version is €199.00 / £159.00 / $199.90, while the top model costs €249.00 / £199.00 / $249.90.